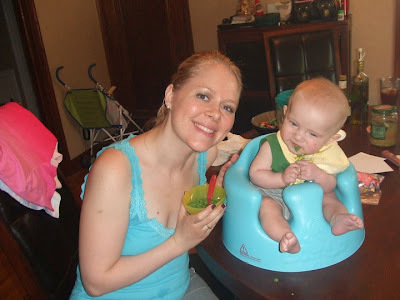 Women on a Mission: Mom Edition: HOMEMADE BABY FOOD! Friends, like all of you, Lori and I (Steve and Shaun too!) do whatever we can to raise happy, healthy children. That is what Women on a Mission is all about. With today’s economy and hardships, we economize as much as we can, too. Tomato ~ free from Thrifty Nana's yard! FRUGAL TIP: Couponing and following your local stores’ advertising sale flyers will allow you to shop as economically as possible. [see Lori’s couponing post] Making your own baby food is so much cheaper too because you are buying the fruits and vegetables at the source; value in the quantity, alone, from making your own is pennies on the dollar. HEALTH TIP: The variety, minimal processing, freshness and assurance of no additives and preservatives are really great. I use Jessica Seinfeld’s’s food nutrition information and puree techniques from ‘Deceptively Delicious’ to make all of the girls’ baby food. The girls ate every fruit and vegetable I could get my hands on – rutabaga, avocado, cherry, blueberry, kiwi, spinach, squash, sweet potato, peas, green beans, carrot, mango, broccoli, cauliflower, red beets – all of them! Bless our daycare provider for doing this during the day too! The girls literally only ate baby food from a jar one time when we went to visit my Dad and Mom Connie (my Dad and Step-mom) in Omaha. Lori and Steve did the same with Mur-Man. As a matter of fact, Shaun, the girls and I were visiting Lori, Steve and Mur-Man last Memorial Day when Mur-Man got his first solid baby food – broccoli! Lori told me that Steve recently commented that Mur-Man ate better in his first year than most people. Lori said that was all because of me – isn’t that nice? Mur-Man's first taste of broccoli courtesy of Ethne! Most of these items you’ll find at the grocery store cost from between $1.00 and $5.00. We bought a lot of fruits and vegetables in the frozen section, too. There is a lot of talk these days about how frozen vegetables are at LEAST as good as fresh because they are flash frozen within 24 hours of being picked from the field. The cost of a frozen bag of fruits or vegetables ranges from between $1.00 to $3.00 and you get a large quantity when it comes to baby food!! The quantity of baby food you’ll get from each vegetable is hard to break down without writing a novel, so I will give you one example: fresh red beets. You will need a food processor or some other pureeing tool like a blender. STEP ONE: To make the red beets, I quarter the beets, place them in a Ziploc Zip-n-Steam bag, and steam per the bag’s instructions in the microwave. There are several other cooking methods, but I found this to be the fastest and easiest. The Zip-n-Steam bags have instructions for cooking various items – if the exact item you’re steaming isn’t mentioned, pick instructions from a vegetable that is listed that has similar qualities to the one you’re using. Full Steam Ahead - 5 minutes! STEP TWO: Once the vegetable is steamed, you can peel it easily, if necessary. This is required for beets. At least it's staining my hands pink! STEP FOUR (A): Disperse the puree as is necessary for you. To use for baby food, keep whatever fresh amount you will need for immediate use, and then spoon the rest into ice cube trays to freeze. Once frozen, pop the cubes out and place in a freezer bag so you can use the trays for the next food. STEP FOUR (B): Now that my girls are eating regular food, I sneak the purees into their foods when I can. I freeze the purees in approximately ½ to ¼ cup portions in the snack-size Ziploc bags. I can freeze them flat and then combine them in a large Ziploc freezer bag for storage. STEP FIVE (A): We found that the girls each ate 2 cubes per meal. We thawed the cubes in a small dish on the counter while we cooked our dinner. If we needed to speed it up, we placed the small dish in warm water (water outside the dish, not inside!) Once it was established that the girls were not allergic to any particular food, we could mix the different food cubes together if we wanted. STEP FIVE (B): For my use now, I take out one snack size bag (or more depending on the recipe) and place it in a bowl of warm water to thaw. Then use in the recipe I’m sneaking it in. FRUGAL SUMMARY: For my red beets example, I spent $1.99 for the bunch of 3 at Super Target. I divided the puree into 4 baggies. This means the cost per baggie was $0.50. Great deal! The cost is even less for a meal’s worth of food cubes because one meal for baby is a smaller quantity than the baggies. 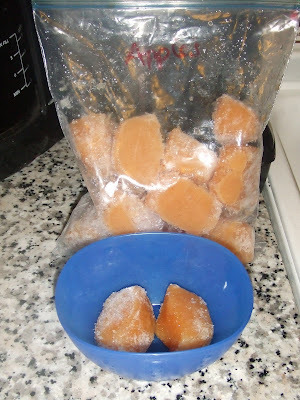 I recall that out of one batch of puree, I was able to get approximately 20 food cubes. At 2 cubes per meal, the price is $0.20 each time you feed your baby. When the girls were a little bigger, we started giving them a fruit and a veggie per meal – still just $0.40. Just for comparison, a one-serving jar/tub of baby food costs between about $0.85 and $0.99. CAN YOU BELIEVE THE SAVINGS?!? Go WOM-POWER!